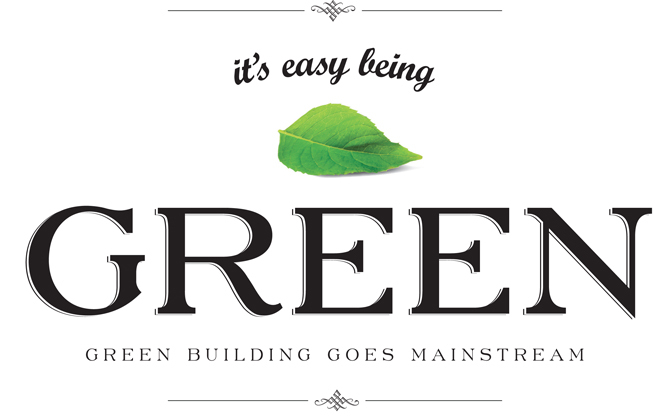 As trends and techniques in eco-friendly building continue to push closer to the mainstream, building a green home is becoming a more viable proposition for the average homeowner. Katherine Wutz talks to three Hailey residents who have taken a step in the direction of sustainability, building comfortable, affordable homes that are also green. It was while standing in front of a burning pile of plastic Coke bottles somewhere in Mexico that Blake Eagle's whole outlook on life changed. A few months previously, he and his wife, Angie, had sold everything, bought a camper van (complete with aftermarket solar panels) and hit the road. The year-long journey, which took them from Banff, Alberta, south to Mexico and Guatemala, really opened their eyes to the challenge of managing garbage outside of a home. "When you start buying your groceries and look at where your garbage is going, [you realize] there is nowhere to put it on the curb and have someone take it away," Eagle said. "You are responsible." The Eagles' own small efforts to limit the waste they produced by purchasing fresh food and buying beer on tap rather than in bottles or cans seemed insignificant when the global problem of consumption hit them full in the face in the form of Mexico's trash bonfires. "There were piles as big as a car on fire every day," he said. "It was like Mexico was on fire the whole time we were there." This experience, combined with a distaste for what he saw as excess consumerism in the United States, prompted Eagle to build a home for his soon-to-be expanding family that would be durable, affordable and, ultimately, recyclable. A contractor by trade, Eagle researched exhaustively to find the perfect material. He finally decided on Hemcrete, a concrete-like substance made with industrial hemp. 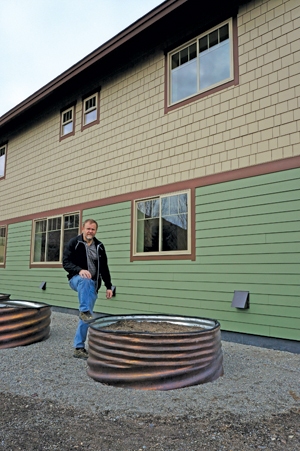 His home built out of hemp looks conventional, but behind the stucco and paint is an industrial hemp and lime-based binder mix instead of traditional insulation and drywall. Hemcrete is a brand of hempcrete, a substance with many of the same applications as traditional concrete, but which is seven times stronger than concrete, about half its weight and more elastic, which means it is less prone to cracking. In addition, hempcrete walls are resistant to mold, because hemp and lime wick moisture out of the air and then release it into the home if the humidity drops. And, unlike most traditional building materials, hempcrete can be taken out of the walls, pulverized and remixed if the house is ever remodeled. That means Eagle can recycle his walls. 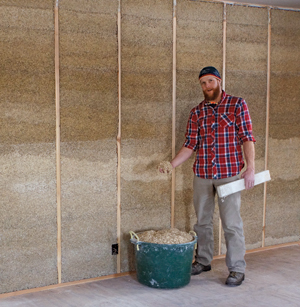 Contactor Blake Eagle grabs a handful of hempcrete, the hemp and lime-based binder mix that he used to build his family home. The structure is the first of its kind in the West. Eagle's home is the first permitted home in the West to be built out of hempcrete. However, despite ample evidence of hempcrete's successful application in housing projects, warehouses and shopping malls across Europe, persuading local building officials that hemp is a safe and legitimate building material was no easy task. "The first thing they asked was, 'Can we smoke your house?'" he said. "I had to back them up and explain." Hempcrete is made from a variety of the plant that is very low in tetrahydrocannabinol (THC) and therefore has little of the psychoactive qualities of its cousin marijuana. The officials were also concerned by hempcrete's lack of an International Code Council report. The ICC, the body that oversees safety of building materials, will release a report on hempcrete in the next year, so those who want to follow in Eagle's footsteps should have an easier time. Eventually, Eagle had to sign a waiver of liability saying he would not hold the city accountable if the walls of his house crumbled. This scenario seems unlikely, however. In Japan, a 300-year-old hemp house is still in one piece. "Over time, the walls will get harder and harder and more durable," Eagle said. "The only thing they have done [to the Japanese house] is resurface the outside." As the wall becomes harder, the material will absorb carbon dioxide from the atmosphere, potentially offsetting carbon emissions that resulted from shipping the hemp more than 600 miles from Canada. Eagle, Angie and their new daughter, 1-year-old Alena, will move into the home this spring. "We've put in some big days and sacrificed some family time," he said. "But it will all be worth it when we're able to move in." Few people would go so far as to send a 2,000-square-foot log cabin rolling down state Highway 75 in the name of reducing consumption, reusing materials and maintaining marital bliss. But that's exactly what Hailey residents Nancy Linscott and Michael Kraynick did last fall, turning a vacation rental cabin from north of Ketchum into a cozy family home in old Hailey. The two had wrangled for months on what their dream home would look like, Kraynick favoring clean and modern looks while Linscott did not. "When we sat down and tried to put pencil to paper, we were on different tangents," Linscott said. Finally, they found a log cabin—just the cabin, not the property—for sale in the Idaho Mountain Express classifieds. The fully furnished cabin sat on property that the current owners planned to turn into a horse pasture. Linscott and Kraynick sensed an opportunity. "Log construction is very expensive now," Kraynick said. "You really couldn't build a log house for anywhere close to what we could move it for, and really probably couldn't build a regular house for anywhere near that." 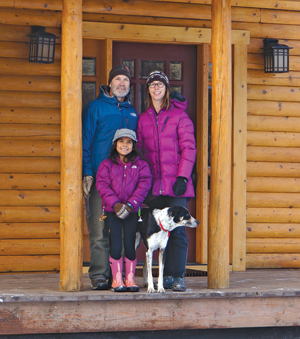 Hailey family Nancy Linscott, Michael Kraynick, daughter Inez and Haas the dog stand in the doorway of their "recycled" home. Rather than go through the expense and environmental impact of building a structure from scratch, the family transported an unwanted log cabin from north of Ketchum to downtown Hailey. "We are pretty big users of the used and discarded," Linscott said. Starting with the home, the couple continued down the path of reusing unwanted materials, buying all the appliances for the newly remodeled kitchen secondhand from sources such as the classifieds and the Building Material Thrift Store in Hailey. "There's always someone doing something around here, or a house in the Fairways whose owners can't stand their new water heater," Kraynick said. Linscott added, "There's pretty much nothing that's not attainable if you're willing to be patient." The largest "discarded" item that the family will reuse is the two-story 1940s house that sits on the Hailey lot that the couple owns. The house's previous owner had died, leaving a house that stank so mightily of cat urine ("unbelievably foul," Linscott said) that it was considered a total loss. Expecting to use it mostly for scrap wood, the couple removed the floor and found that most of the smell went with it. Now, the house serves as a woodshop and storage shed, outfitted with windows and doors from the thrift store. "There's this something old, something new feel to the whole project," Linscott said. The two-story, four-bedroom home in the family friendly Northridge neighborhood just north of Hailey has three and a half baths, a large bonus room and common space on the second level. Granite countertops, Kraftmaid cabinets, a large laundry room, wool carpets, oak floors, a garage and large yard with raised flowerbeds and drip irrigation round out a house that has every feature that a family might want in a new home. But behind the facade lurks a secret. Builder Thad Farnham has injected this ordinary-looking home with the latest in green technology, offering one other thing every family might want—a heating bill under $100 a month, even in the depths of winter. Farnham's modus operandi is simple: Use conventional methods to build the most efficient house possible. "A lot of my construction methods are old school, but they're executed to the highest level," he said. "It's fun as a builder to have these challenges, to figure out what is the most efficient way to build a house that is as efficient as can be." The secrets of the home's low power bill are hidden within the walls and windows, in the frosted-glass LED light fixtures scattered through the house and in a small closet just off the laundry room. The house features the standard two-by-six studded walls, but instead of one single wall, Farnham has built two, filling the gaps with the standard fiberglass insulation. This method helps prevent "thermal bridging"—heat being conducted from the inside of the house to the outside through the studs. The R-value, or resistance to heat loss, of an average exterior wall with modern fiberglass insulation is R-21. Farnham's walls have an R-value of 38, with an R-value of 60 in the attic. Thad Farnham has built a standard family home that boasts heating bills of under $100, even in the depths of winter. The home also features Pella fiberglass windows filled with argon gas, which are as efficient as a standard double-paned window can be. Farnham had toyed with the idea of using triple-paned windows, but decided that the benefits did not justify the expense, especially for a home that he was going to put on the market. "Triple-paned windows are out of the range of most people," he said. All of this contributes to keeping the home virtually air-tight. Unfortunately, this can lead to complications. For example, traditional homes are typically ventilated "passively"—that is, fresh air seeps in through the walls and through poorly sealed windows, keeping air in the home fresh but making the house's heating systems work harder to keep up. In Farnham's house, fresh air comes from an air exchanger in the laundry room closet. The exchanger pulls fresh air from the outside and heats it using the stale interior air as it is picked up and expelled from the home. It also brings the fresh exterior air temperature to 76 percent of the temperature of the interior air, leaving less work for a traditional furnace. The effort put into efficiently heating fresh air pays off. The heating bills for November, December and January averaged $60 a month, only climbing to a high of $74 for the month of January, which had nearly record-breaking cold. In contrast, Farnham's own home, which is 500 square feet larger, racked up power bills well over $200 a month. "There's such a vast array of things you can do to make a house green," Farnham said referring to advances in solar and other green technology. "[But] I want people to walk in and not feel like they're walking into the middle of a science project. I want them to feel that this is a normal, conventional house, but I want them to be surprised when they get their energy bill." 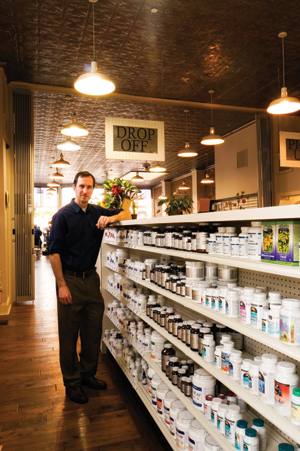 Luke Snell shows off his remodeled Main Street pharmacy in Hailey. The hemp house, log cabin and air-tight home featured in our story each have one more green accolade to add to their eco-cred: they're participating in the city of Hailey's Construction Recycling and Diversion Pilot Program. The program was launched in February 2011 to address the startling statistic that the building industry is responsible for 25 to 40 percent of a community's landfill waste. It also attempts to mitigate the greenhouse gases generated by the 200-mile round trip from Ohio Gulch Transfer Station to the landfill in Burley. In its first two years, eight local building projects, including the Blaine County School District's maintenance building, Hailey Elementary School and the River Street apartment development, participated in the program. The five projects that are now complete saved $8,242, diverted an average of 49 percent of construction waste away from the local landfill and avoided emitting 206 tons of CO2 into the atmosphere. The program is funded by a three-year grant from the Environmental Protection Agency, and is part of Hailey's Community Climate Challenge, which is designed to empower people to save energy and money, support the local economy and share ideas with other communities. The construction program offers contractors up to $500 for costs associated with diversion and recycling in exchange for their commitment to divert and recycle as much as they can, so the city can see how to make the process most efficient for contractors in the future. Luke Snell and his contractors K&M Construction participated in the program with the remodel of the 120-year-old Werthheimer Building on Main Street in Hailey, from clothing store to the ideal space for Luke's Family Pharmacy. 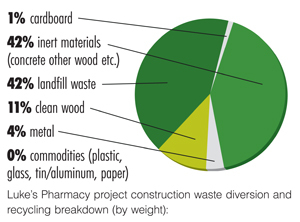 The project diverted 56 percent of its waste and saved $120 in waste disposal costs. The key to their success was in the three R's—reduce, reuse, recycle. Reduce: Snell cut the amount of materials he needed by embracing the style and charm of the old building, including no false ceilings to cover the old tin tiles or drywall to hide the aged brick of the interior walls. Reuse: "There were some nice items left behind from the previous owners that our local second-hand stores could sell for good money (computers, shelving, clothing racks, banisters, etc. ), which is just keeping money in the local economy," Snell said. "There are a few shelving units that I will be using downstairs once the project is complete. There was nothing that I personally had to dump in the trash or take to the landfill." Recycle: Snell's recycling of demolition materials involved collecting clean lumber (wood without any toxic glues, paints or stains) from inside the walls of the previous interior, which went to Ohio Gulch to be recycled into compost, costing Snell only $10 per ton, versus the $65 per ton if it had gone direct to the landfill. Once the site was ready for construction, K&M stepped up the recycling efforts. Owners Erik Nilson and Brian Donelly flattened and recycled all cardboard, first at the Park and Ride lot, where Hailey residents and businesses can recycle clean corrugated cardboard for free, and then in their own trash container (trash container rental and cardboard pickups are also free in Hailey). Next they ordered free recycling bins to keep on-site for disposal of plastic bottles and aluminum cans from crew lunches. Finally, they took any clean lumber waste to Ohio Gulch on their way home from the site. Recycling just those four materials significantly reduced the amount of waste the contractors had to take to the dump. This is the final year of the grant, and the city is hoping to work with five more area contractors to further define and simplify the recycling and diversion of construction waste. The success of the program has prompted the city of Hailey to require recycling bins at all building sites in its proposed green building code, which is on track to go into effect in May. "Without tracking and quantifying the disposal information, we would never have guessed we would see such great results," said Mariel Platt, the city's sustainability coordinator. "The data and feedback we received from participants have proven beneficial in other areas as well. It has helped the city make more informed waste management decisions, both with the city's rubbish and recycling franchise agreement with Clear Creek Disposal and with the proposed Build Better Program." For more on the Build Better Program, Hailey's proposed green building code, visit haileycityhall.org/building/bbp.asp.